I am so embarrassed by the fact that I have yet to mention the fact that my sweet Lil' C turned ONE last month. The eve before her birthday I was singing to her at bedtime and I burst into tears. Where had the year gone? How could my little baby girl actually be a walking, babbling toddler??? Not knowing if she is the last child for us or not got me very emotional. I hugged her tightly and sobbed into her little downy head. We celebrated her birthday with a big family party down on the "farm". 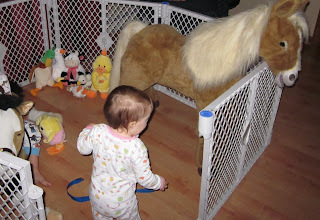 Our home was transformed into a farm, complete with a stuffed petting zoo! Real petting zoos cost too much and smell so I constructed a stuffed one out of an octogon baby gate, my friends Fur Real Horse Butterscotch (it is the size of a real pony, moves and makes noise) and a bunch of other farm stuffed animals that we borrowed or already had. It was so much fun for the kids and Lil' C and Z LOVED it!!! 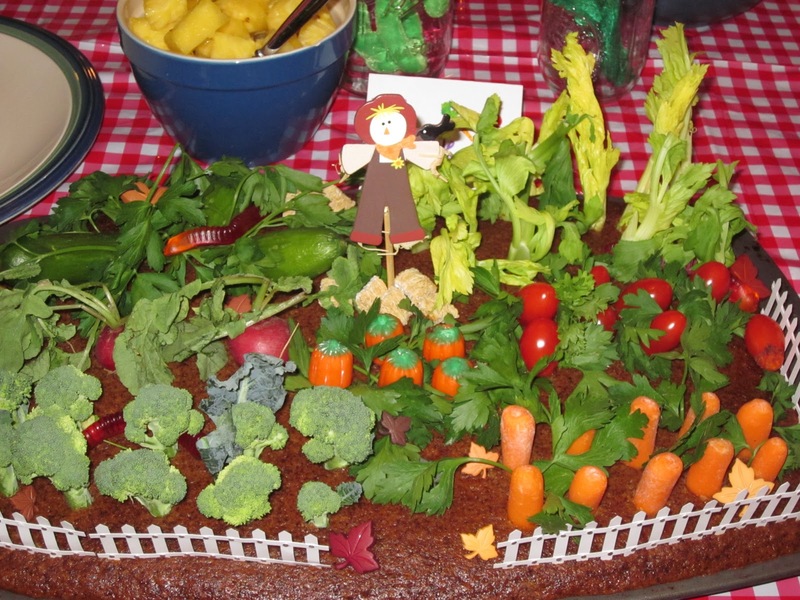 My mom created this wonderful veggie platter....isn't it amazing?? 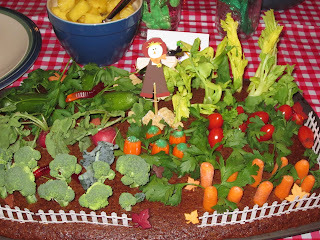 The base is gingerbread and then she made a garden complete with shredded wheat hay bales, gummy worms and a paper scarecrow :) For a menu we made "fence post french" toast sticks", "chicken little" nuggets with dipping sauces, "chicken feed" (candy corn), "stick in the mud" mini muffins, "farm house" flatbreads and "cowboy chili with kiddie coral corn bread". For games we had pin the hat on the turkey, a paper pumpkin scavenger hunt and I printed a farm for each child to color with paper farm animals to color for their farm :) We even had an adult game of farm trivia questions :) For favors, I had farm animal beanie babies that I got at AC Moore with gigham ribbon tied around their necks. The party was a lot of fun for me to put together (Z helped once again), I pulled off a lot within a very strict budget and I think everyone had a really good time. That garden looks incredible! I may have to make one for football viewing consumption. I love planning the kids parties! Happy Birthday Lil C!! I want a pony now!!! I saw the cake in the online images and had to come see about it, but am "WOW"ed with the whole party! Gosh, I wish I were that creative!